In this third volume of Greenwood's Great American Orators series, Logue delineates the oratory career of Eugene Talmadge whose public speaking illustrates the use--and some would say the abuse--of a most necessary democratic institution: free speech in the political arena. Logue notes in Talmadge's speeches the seeds of today's public discourse, preoccupied as it often is with distorting issues and conduct. Talmadge based his political rise in Georgia on appeals to the experiences, values, and prejudices of his listeners; perceptions that were geographic, social, and racial. For Talmadge, campaign issues were ultimately less important than his colorful persona and seductive public oratory--a brand of politics that came to be known as Talmadgeism. This volume represents a landmark study in the genre of rhetoric by which citizens and issues are exploited primarily for personal political goals. In Part I, Logue presents critical analyses of Talmadge's political and persuasive strategies and performances, plus an assessment of people's responses to them. Part II contains authoritative speech texts representative of Talmadge's campaign oratory and post-election rhetoric defending his policies and causes. A definitive bibliography contains important primary and secondary materials that relate to both the man and his works. The chronology of speeches includes places, dates, and lists of most of the orator's known speeches and addresses. 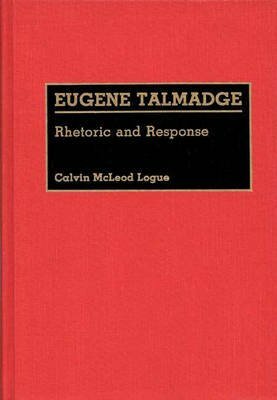 Students and scholars of the history and criticism of American public address as well as students of the American democratic process and southern politics will find Eugene Talmadge: Rhetoric and Response an important addition to both their libraries and their thinking on this vital subject.